This chapter aims to tackle end of life issues for patients and their families. It will reflect on the process of disease to understand when “end of life” begins and what this stage entails. It will also address adjusting expectations and treatments, symptom management, and emotional and spiritual care at this stage of the disease. Care for end-of-life patients who are dying and their families will additionally be addressed, as well as the attention that healthcare professionals provide to patients and their families in consideration of different religious perspectives. Hanks GWC. 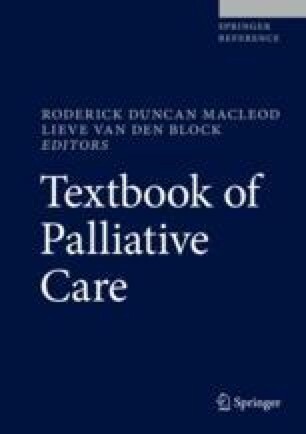 Oxford textbook of palliative medicine [Internet]. Oxford University Press; 2009 [cited 2017 May 25]. 1666 p. Available from: http://innopac.unav.es/record=b2213267~S1*spi#.WSbUfiEwEuA.mendeley&title=Libro de la Biblioteca de la Universidad de Navarra&description=Libro de la Universidad de Navarra. National Institute for Health and Care Excellence. Care of dying adults in the last days of life [Internet]. [cited 2017 May 28]. Available from: nice.org.uk/guidance/ng31.